There will be a professional fireworks display from Scotland’s premier fireworks exponent. Hot food and drinks will be available outside the Classroom and the roads will be shut off from 5.00pm onwards. 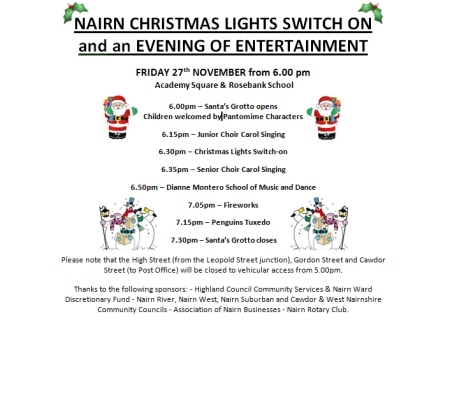 All in all, it’s going to be a another great night of Nairn festive entertainment and cheer." Here's how it looked last year. The Gurn understands however that there will be no Christmas Tree Festival in Saint Ninian's Kirk as permission was refused for this year. Fireworks, they're having bloody fireworks! They didn't have fireworks at the bonfire so why are they having them for the switch on of the Christmas lights? Well done to Michael Green, this is exactly the kind of events this town needs,keep up the good work !look forward to seeing what else you have in your diary!